Taco Bell adds new Mtn Dew Spiked Lemonade to their current selection of slush ice Freeze drinks. The Mtn Dew Spiked Lemonade Freeze is priced at $2.49 for a regular 16-oz drink. You can also find it discounted to $1 from 2 to 5 PM. 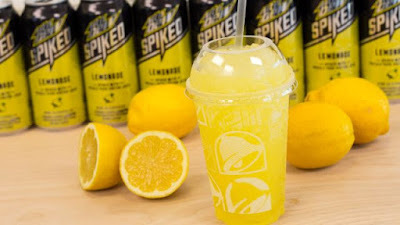 The current Freeze menu at Taco Bell includes Mtn Dew Spiked Lemonade, Mtn Dew Baja Blast, and Starburst Strawberry. I tried the new drink recently. It's not too sour for lemonade and pretty much tastes like lemonade and Mountain Dew mixed together (which is fine by me). I couldn't detect any sense of the prickly pear cactus juice.